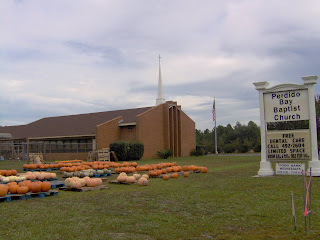 There's still lots of pumpkins at Perdido Bay Baptist Church. Proceeds benefit their Missions program. Here's our son so into his costume, he forgot his mask was still on. "Frolic" I say! 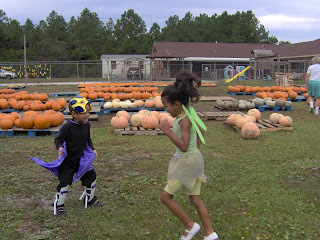 Bibleman & Tinker Bell enjoying the pumkin patch. 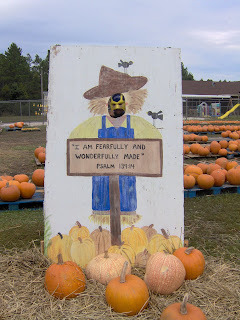 They gave us a Pumpkin Prayer card when we bought our pumpkins . We've prayed it a few times already. 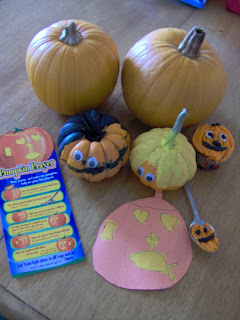 Then I found this story called A Pumpkin Parable by Liz Curtis Higgs. So much about Halloween is focused on darkness, this story brings light and a great message for our kids. I found it here, but you can just play it now. Below is a fun craft based on the book above. Valerie is awesome with crafts and curriculum. Visit her here for Thanksgiving crafts! I hope you will have a safe and fun Halloween! 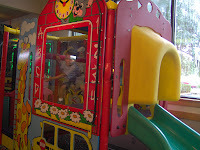 For family fun, we stopped at Chuck-e-Cheese to redeem my son's FREE 20 Birthday tokens and 20 FREE Halloween tokens. I think you have to sign-up, but the Halloween coupon is good through Nov. 1. We had the BEST time there. They open at 9am and we went in at 9:06am. No one was there and our kids got to just run around and not have to wait their turn. Then hubs totally rocked with the basketball game, making an all-time store record of 203! Baby girl even got lots of tickets from Battleship. Early mornings on weekdays is the best time to go! Payless has 50% off ANY shoes today for the Oprah Show viewers. We stopped by the mall to get $2 Costumes at Old Navy but left disappointed. That frown turned quickly to a smile for right across from Old Navy at Cordova is Payless! 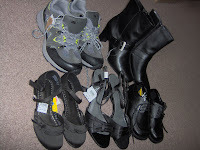 We bought shoes for the entire family (two for Mommy- how nice!) for $53 for 5 pairs. The last time I bought new shoes was before 2000! It was a real treat buying these for about $10 a pair! Next to Old Navy was Victoria's Secret. I had a long-awaited bra fitting. I've been wearing the wrong size all these years. Blame it on having kids! Since I signed-up for Pink Nation, I was able to print a coupon for $10 off any bra. Plus I used a Q for FREE lip gloss w/ bra fitting. It only cost $15 for my bra and lipgloss. A savings of $17! $0.49! Just like Hip to Save reported! I also bought 2 contact paper rolls for $0.87 each, $0.75 deck of cards for Low Vision challenged (that's what it says on there) and a box of gloves for $5. We use these disposables for cleaning the toilet, behind the faucet, gardening and such. The Stacy's Pitas were $1 each after Q & RR. I also bought two 1Minute Quaker Oats for $1.70. But it didn't print the $5 RR. So I might return it since I can get it cheaper at Wal-Mart. I need to just leave a box in the car for returns when I can't take care of the problem right then. The monthly RRs are still working: Vaseline and Dentek printed RRs to make them FREE! I'll roll these RRs at Publix to buy All Small & Mighty ($2.99 sale). With the RRs I can get at least 5 bottles free. Old Navy opened with a line of at least 40 people waiting to get in. The 1st 50 got a nice Reusable bag and 50% off. The catch was that you had to show your Old Navy card or sign-up for one. So they wouldn't let us have a bag. Bummer. There's no way I would get another card for a long, long, time. Only a few costumes were left and all were winter-wear, like fuzzy fleece butterfly. There were Halloween T-shirts, socks, etc for $2. Bath and Body Works also has a FREE Pocketbac with purchase. But it was so small and the gift bag too (purchase can be as little as a $1 item) so I just gave my coupons away to a lady. Publix has this $4 off 4 GM or Nature Valley items In-Ad Q. 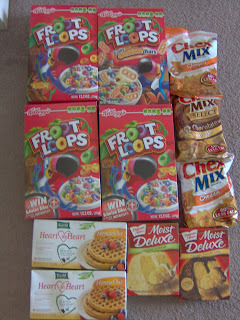 But it appears to be only for the GM Cereal and granola on sale. Unlike our blogger friends in GA, we are not getting that deal- I even called corporate's marketing dept! Now they are passing me off to the District Manager. We'll see, the deal end Tuesday so I still have time. Applebees FREE costumed kids get FREE kids meal with adut entree. Sonic Drive-Thru 50 cent corndog from 4pm-? There's a lot going on by Cordova mall that day. Enjoy! Go to A Thrifty Mom for some of these links. Frugal for You is proud to be part of the Grocery Gathering! See the Publix Ad here. 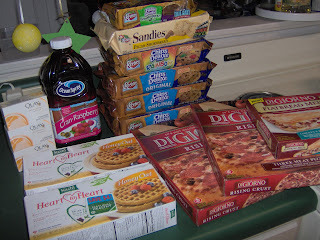 Go to I Heart Publix for coupon match-ups. See the Winn-Dixie ad here. They have coupons here too! Target is my flavor of the week! Lots of good, cheap stuff. While I was there again today (hey, a girl's gotta get out of the house for some fresh air, right?) I saw they have the Dollar Spot: 30% off on items with a Green Dot. They also moved out all of the Halloween $1 items will be rearranging things. Of course they'll be on clearance Nov 1st! 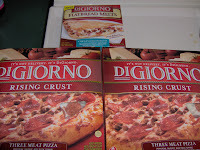 Final cost $7--for all 3 pizza products! Thanks Hip To Save! I baked this right away when we got home. After the kids went to bed had a pizza date and watched our FREE movie from Kelloggs (Eight Men Out). Go here or just scroll down to the next post to see the breakdown of the rest of the prices. On the shelf , the price for Ocean Spray still says $2.79. So I checked the price on the price scanner and found it was on sale for $1.98. 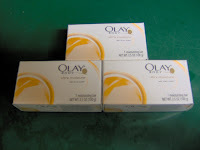 I used $1 Target Q plus overage from other items and got it for FREE! So when you check the prices from other blogs and it's not the same for your store, check it on the price scanner because they may just be on sale after all! 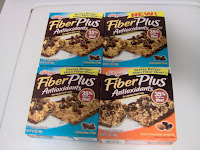 Buy 4 Kellogg's FiberPlus Antioxidant Bars (5 count) at $1.99 each and get $5 Target gift card! Pay $5, Get $5 Gift Card - FREE after GC! *There are still a lot of this left at my store and the Gift Card promotion is STILL unadvertised. But I checked it on the price scanner and sure enough, the promotion is still going on! I bought these a while back when I had $1 off coupons (no longer available) and got $1 overage. 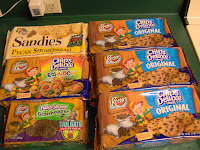 Target Price Matching Deals and FREE Cookies! The PG insert usually has $1 off Olay bodywash or barpack. I've been able to use this for the single bar in the travel/trial size section. 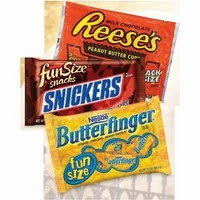 Kmart $1.88 candy, Nestle is included. The catch is you have to buy 4 to get that price. "Limit 4. 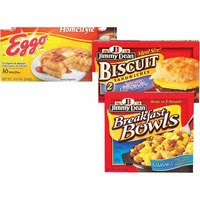 Purchases of less than or more than 4 are $2.49 each"
(Jimmy Dean Breakfast Bowls, 7 or 8 oz. Lastly, I saw a coupon peelie on some Kashi TLC bars (found hidden at endcaps). there were 2 Qs good for any Kashi: $1/1 Kashi Target Q and $3/2 Kashi Manuf Q. Got 2 FREE waffles plus $1 overage! This is just a few great finds this week at Target. 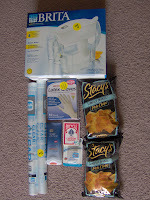 Check-out Thrifty Mama's Mr. Linky post on other great Target deals! Read Hip to Save for details. Check out all their coupons for Airwick, Finish and Lysol. I would personally do this deal at Wal-Mart and price-match it there to get the overage. 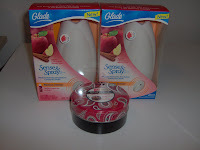 I wonder if these work with the Air Wick Freshmatic. Because refills without the thing to RE-fill is pretty silly. But call me coupon crazy, I think I'll still get it anyway! This recipe is so easy it borders on non-recipe. Mix and pour in greased pan or muffin tins. Bake 20-30 minutes until done. Voila! These are so, SO, moist! And, a nutritional tidbit, adding pumpkin adds only 20 calories per serving! 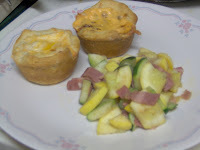 Baking it the regular way with eggs and oil adds a whopping 90 calories per muffin. So, stock up on cake mix and cans of pumpkin (you can also use 2 cups fresh) when they go on sale this holiday season. Last year, I was able to snag a case of 25 cans of pumpkin for $0.25 each. The cake mix was only $1.15. So only $1.35 for the whole thing! Do you love pumpkin? I mix it in soups and sauces too. When my friend told me about this recipe, I was so intrigued I had to try it. I'm glad I did because my other recipe called for shortening which totally cancels out healthy pumpkin! But never again will I substitute it for oil in a brownie recipe unless I try to make biscotti. Let's just say the "brownie" was great for dunkin' in coffee. 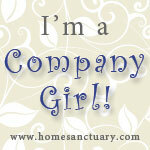 I don't think I'll be CVSing this morning so I thought I might share something about our family, well, about me... I'm a recovering packrat! 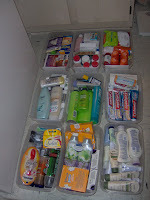 Since I have started doing the drugstore "game" a few years ago, I noticed the quick accumulation of toothpaste and shampoo overflowing the only real storage space we have- under the bathroom sink. So last year, I determined to corral all these wonderful bargains in a more presentable manner. First, I got all the stuff I crammed in there out in the bedroom and started with a fresh clean slate. Then I stacked them back in there, with labels. Why didn't I label these sooner? 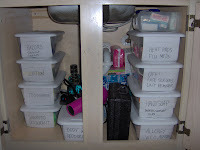 I put my feminine stuff in the back with the Listerine bottles. We also have a first aid kit, hair dryer, and haircut tools. Later I added a spa bag, sunscreen bin, and candles. I have no idea how all these things can fit in there but they do! It's now very convenient and accessible. And I know that we have enough for a long, long time. So when I get free items from CVS or Walgreens, I designate those in a giveaway box. 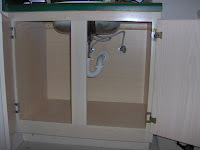 Or I upgrade what's under the sink. I now don't feel the need to rush in the store for that free toothpaste! Oh yeah, I have some anxiety issues about bargain shopping too. I'm a mess but at least our toiletries are not! How about you? Where do you keep your stash? Every Saturday and Sunday, I check out the deals posted on my favorite blogs and also in the newspaper sales ads. I write down my shopping list in my notebook. Then during the week, when it's time for me to go shopping, I check those blogs again to see the coupon match-up and deal updates. This way I never do the deal searching by myself. I use the wealth of time and resources of the couponing community found in these bolgsites. It used to take me a whole day to figure out the CVS and Walgreens deals before we had internet. (I did this for two years! )That's why I usually don't post deals myself as much. If I do find something myself, like from my own shopping trips, then I do my best to take a picture and pass that info on to you. Why reinvent the wheel? These I Heart sites have the ad scans at least a week early! Plus, lots of coupon match-ups. I'm getting started menu planning early this time. Can you believe it's almost November? We still have food leftover from September's freezer stash. Since there's always lots of great deals after Halloween (pumpkins and candy galore), plus Thanksgiving brings cheap meats, we'll have to start making some room in the freezer. 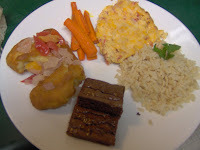 I don't get what the obsession is but I join 300+ bloggers every Monday and show off my meager menu plan. Check out the hype here. The Rayovac is FREE using the $1 off coupon from the paper. They have them at Target also. The Duncan Hines is regular price. Target did not have spice cake. 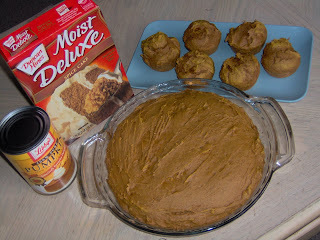 A friend gave me a simple pumpkin bread recipe using only the cake mix and 1 can of pumpkin. Intriguing. I'm going to try it and let you know how it turns out! 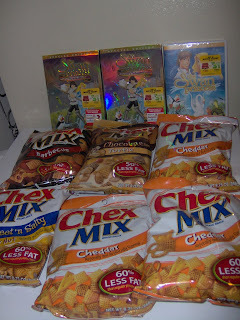 $1 for 2 Chex... still a good deal! See that yellow sticker? It says: Get A Movie Ticket! Up to $7.50 for Cloudy with a Chance of Meatballs or Planet 51. 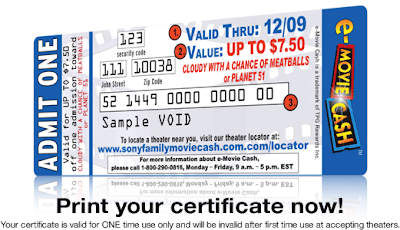 You just enter the code on the back of the sticker here and print the movie ticket. I got this movie a while back but hesitated to post it because this was the only copy I saw there. 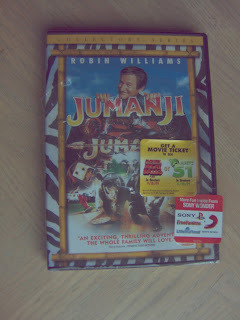 But today, I saw a few other movies from the $5 wall that had it: Swan Lake Princess and Jumanji. And at the regular movie section, there were a few $9.99 DVDs that had the sticker too. The great thing about this is that I used that Staycation DVD $2 coupon here. So the DVD was only $3, plus a FREE movie ticket! This coupon was posted by Hip To Save in July. It's still good through Oct 31! The $3 movies will make great stocking stuffers. But getting FREE movie tickets to boot just takes it to a new level of Family Entertainment. Even if you don't care for the DVD & buy it just for the free movie ticket, remember Christmas is coming up. This will be great for Christmas Angel Tree presents, too! SC Johnson Rebate- Limit 3 Per Household! "Limit 3 SC Johnson rebates per household. Each $5 Rebate must be mailed separately..."
Then I was thinking of buying 3 Ziploc bags (included in the Rebate) for the 3rd form. Or maybe the small Glade candles using this $3 off 2 coupon. Target and Wal-Mart both have $3 candles. Pay $5 But get $5 Rebate so it's FREE! Thanks A Thifty Mom! 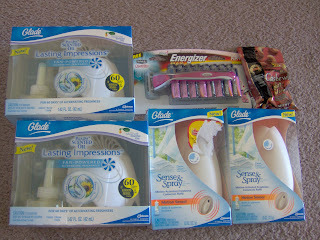 She posted CVS Store Coupons for Glade Sense and Spray and Lasting Impressions. These are on sale through today for $5. I was able to snag 4 FREE Glade products. FREE, just paid $2.25 for Tax! I could have saved even more if I used a $5 off $25 Survey coupon and the $1 Energizer Q. But I am happy to get so much for so little (especially that many batteries). The only problem now is that I am all out of ECBs! Price-matching at Target is best when Target coupons are also available. 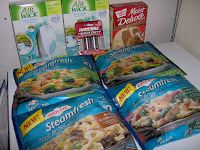 Thanks to Hip to Save, I was able to snag some cheap items this morning by matching Walgreens ad and using Target coupons. $1 for 4 or $0.25 a box! Price-Matching Rocks! So keep a look out this week for other deals you can match at Target or Wal-Mart. 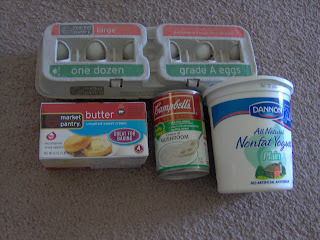 If your family does not like it, please donate to your local Food Pantry. They are thankful for any help! Want more FREE stuff? I found peelie coupons on Kashi TLC (at the endcaps). 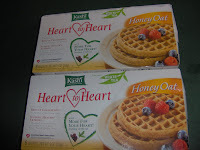 These were good on ANY Kashi so I bought frozen waffles because they are the cheapest Kashi items. I took 2 peelies off since we don't need that many. It's not against the law to take off a bunch of peelies but it's important to stay courteous and stay under the radar as much as possible! $1 overage, 2 FREE boxes! Looks like hard work... but I cheated. Pumpkin bread was the only thing from scratch. Thanks Pillsbury and Betty! The biscuits and sweet rolls were only $0.50 per can or free a couple of weeks ago. I'm not ashamed. Gone are the days of homemade cinnamon rolls. I've accepted that! 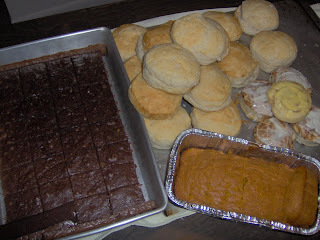 FYI: Do not substitute pumpkin for oil (even for just part of it) when making brownies. You can really tell they healthier (ie tougher, but great for dunkin' in coffee). 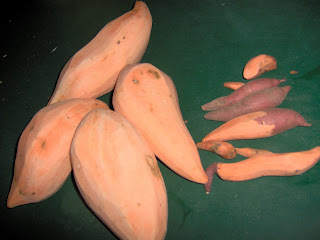 A few weeks ago, I bought sweet potatoes on sale for 3lbs for $1. They were still in great shape considering I left them out in a bowl on the kitchen counter all this time. Since I bought broccoli this week, I decided to make stirfry. This was from a recipe I've made that also included ham and noodles. But they veggies by themselves tasted great. All I did was saute it with onion and garlic and seasoned it with Worcestershire sauce, salt and pepper. 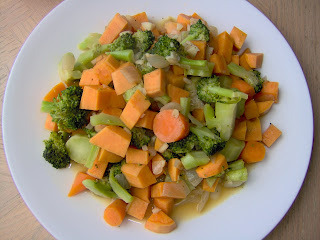 What a healthy side dish this makes! 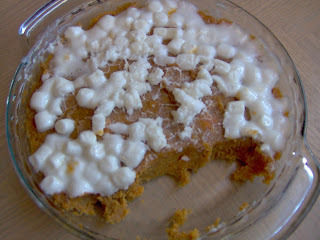 To avoid using the oven, I made this no-bake sweet potato "casserole" by simply boiling 2 chopped sweet potatoes. Then I mashed it (still in the pot) and added a few tablespoons of brown sugar, 1/4 tsp cinnamon and 1 tsp vanilla. After mixing, I smoothed it into the pie plate and added the marshmallows on top. (Which were frozen- yes, I freeze my marshmallows so they don't get all mushy in this Florida heat!) Voila! No butter, no baking, but tastes just as great. These are all the sweet potatoes I used for these two dishes. The small ones on the right are from our sweet potato plant. Yes, you can grown this in a 5 gallon bucket! I don't know how long I should have kept them in there to get them to grow as big as the store bought. But it was amazing to pull them out of the bucket. The plant itself is so unassuming, there was no way to tell of the gems hidden in the soil below. 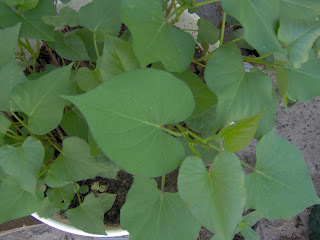 When we have an in-ground (not in-buckets) garden then I am definitely planting sweet potatoes. Plus you can use the top leaves for soups. How cool is that!